Chairman Isakson, Ranking Member Blumenthal and Distinguished Members of the Committee, on behalf of Iraq and Afghanistan Veterans of America (IAVA) and our more than 425,000 members and supporters, we would like to extend our gratitude for the opportunity to share our views and recommendations regarding these pieces of legislation. While there are many important bills before the Committee today, the most pressing topic our members and the veteran community continue to urge action on is accountability at the Department of Veterans Affairs (VA). Just under a year and a half ago, whistleblowers revealed a wait-list at the Phoenix VA hospital that rocked the veterans community and the nation. It was revealed some employees engaged in the manipulation of wait times. The scandal did not stop in Phoenix; 110 VA facilities across the country also kept secret lists in order to hide wait times. Congress responded with the Veterans Access, Choice and Accountability Act (VACAA) in order to empower VA to clean up its personnel problems. 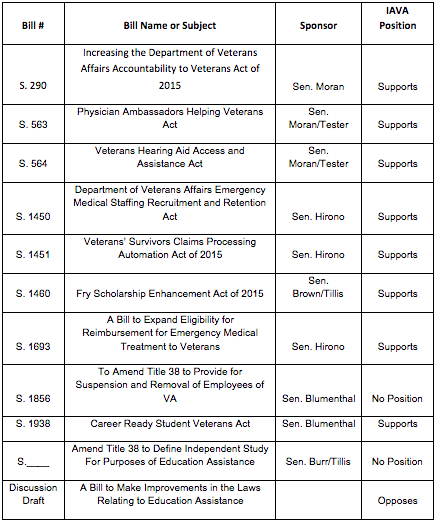 In addition to VACAA, IAVA supported the House-passed VA Accountability Act (H.R. 1994), which expands the firing authority authorized in VACAA from SES employees to the greater VA workforce. IAVA believes the vast majority of VA employees perform their job properly and to the utmost of their ability, but it is the occasional bad actor that needs to be held accountable so our veterans do not have to endure another Phoenix-like episode again. In a recent health care survey, 50 percent of IAVA members reported utilizing VA services, so IAVA understands the need for reform at the VA, and we believe reform begins with accountability of all VA employees. Ranking Member Blumenthal’s bill (S. 1856) is a step in the right direction in getting VA accountability legislation passed in the Senate. However, IAVA takes no position on this bill at this time because we believe certain provisions of this bill lack the strength necessary to actually hold VA employees accountable. The removal of employees under this bill can only be authorized by the VA Secretary if the employee’s performance or misconduct is a “clear and direct threat to public health or safety.” This standard is extremely high and vague; few could possibly meet this standard, maybe not even those employees who were responsible for the heinous actions that occurred at the Phoenix VA. The VA Secretary needs real authority and the ability to remove actual bad employees, not just those deemed “a clear and direct threat” to the public. While S. 1856 is not as aggressive as IAVA prefers, we do recognize value in this bill as a path forward on VA accountability in the Senate. IAVA is concerned the Senate may come to an impasse when it comes to VA reform and this bill, and others relating to VA accountability, will be used as political fodder in the upcoming election cycle. This would not only be a mistake, it would be a huge disservice to our nation’s veterans. As a community, we have to find a strong middle ground going forward when it comes to accountability at the VA, or our veterans will suffer the consequences. While accountability at the VA is a top priority for IAVA, defending the Post-9/11 GI Bill continues to be of high importance for IAVA and our members. According to IAVA’s 2014 Member Survey, 62 percent of respondents indicated either they or their dependent have used the Post-9/11 GI Bill and 42 percent of respondents also indicated they are currently enrolled in a degree, certification or training program. IAVA was a leader in driving the passage of the Post-9/11 GI Bill in 2008 and championed upgrades in 2009 that expanded eligibility to more than 500,000 veterans. Despite the enormous success of this piece of legislation, there is a continuous need to protect against fraud, waste and abuse. An example of such waste and abuse is in regards to helicopter and fixed wing flight schools. A loophole in the Post-9/11 GI Bill allows flight schools to work as contractors for public institutions and train veterans completely at the expense of the government and at twice the amount non-veterans pay, which amounts to tens of millions of taxpayer dollars each year. According to a VA investigation, it costs $1,800 per hour of flight training and students are required to train for 200 to 300 hours. For one veteran to receive training it could cost up to $500,000 in Post-9/11 GI Bill benefits, as reported by the L.A. Times. If this is not an abuse of the VA benefits system, then there is not much else that will be considered waste. On March 24, 2015, IAVA testified in front of the House Veterans’ Affairs Committee Economic Opportunity Subcommittee, where we strongly supported Chairman Wenstrup’s GI Bill Quality Enhancement Act (H.R. 476), which caps flight school training fees at $20,235 per year in order to prevent exorbitant costs for high-end training programs. Unfortunately, the Discussion Draft put forth at today’s legislative hearing only serves to further the abuse of Post-9/11 GI Bill benefits as it places caps on certain programs but purposefully leaves out flight school programs. IAVA strongly supports capping pay for flight schools and a bill that leaves out a provision for such obvious waste does a disservice to all veterans and weakens the intent of the Post-9/11 GI Bill. At IAVA, we believe our members, and all veterans, deserve the very best our nation can offer when it comes to fulfilling the promises made to them upon entry into the military. There is no doubt every Member of this Committee has the best interests of our veterans in mind when drafting legislation. But we do hope you take into consideration and implement what we, and our fellow veteran service organizations, have had to say on these pieces of legislation today. Biography of Elizabeth Welke, J.D. 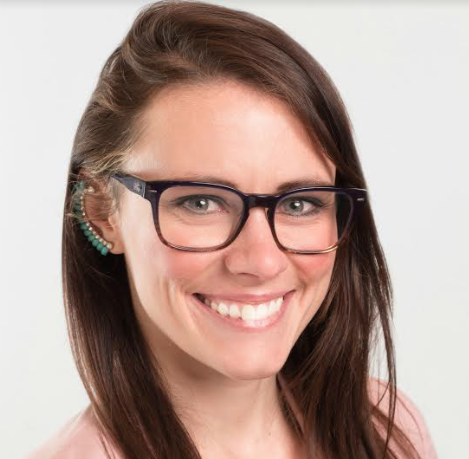 Elizabeth Welke is the Legislative Associate for the Iraq and Afghanistan Veterans of America (IAVA) where she maintains Congressional relationships and supports advocacy programs. Elizabeth received her Bachelor of Arts in Political Science from the University of Iowa, Iowa City, IA and has a J.D. from Regent University School of Law, Virginia Beach, VA. She is the proud wife of a U.S. Marine Corps veteran who served in Operation Iraqi Freedom from 2005-2006. Neither Mrs. Welke, nor the organization she represents, Iraq and Afghanistan Veterans of America, has received federal grant or contract funds relevant to the subject matter of this testimony during the current or past two fiscal years.